Anyone who’s ever been to Southern California or Baja, Mexico knows how awesome fish tacos can be. We eat them like New Yorkers eat bagels, or Wisconsinites eat brats. Which means all the time. Every time I make fish tacos, the accompaniments are different, but there’s always lime, pickled onions, a salsa and avocados. 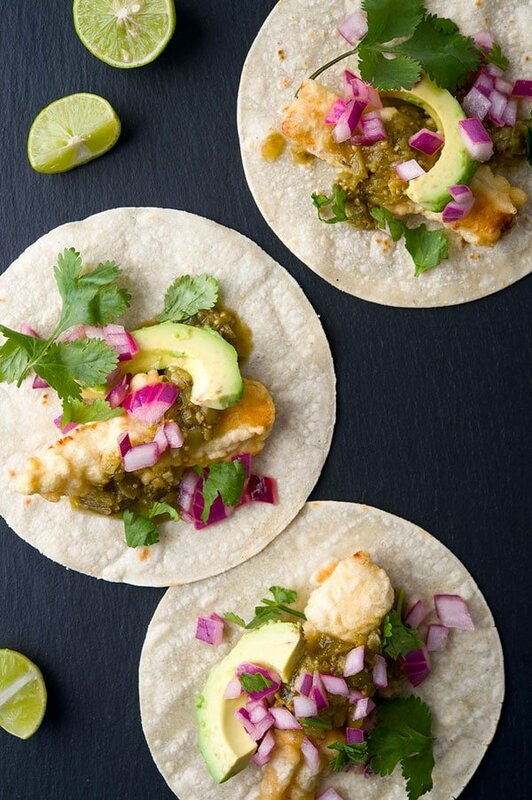 Fish tacos come in two basic types: Grilled and fried. 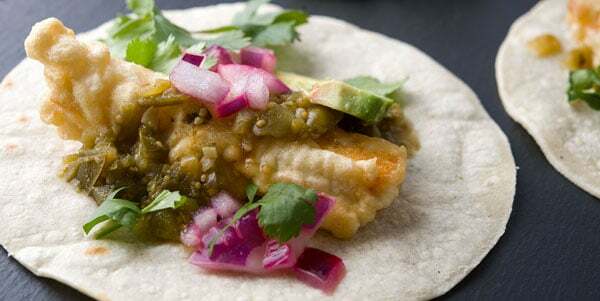 Mostly what you get at taquerias are fried fish tacos, and my rendition of this works really well — and is a lot lighter than you might think. Why? Tempura. I used that lighter-than-air Japanese batter on the fish, to keep things clean. You’ll see. As for what fish to use, I used California halibut, which, like it’s larger cousins, is a very firm, very white fish. You can use pretty much anything. If you want to do a great spread, make some fish ceviche to go with these tacos, so people can switch off between fried fish and the zippy marinated fish in their tortillas. Serve with plenty of beer. Obviously this works with any fish that's good fried, which is most of them. Avoid oily fish like mackerel or bluefish or herring, and I really don't this this is an ideal recipe for salmon or trout. But other than that, go for it. The accompaniments to the tacos are also up to you. 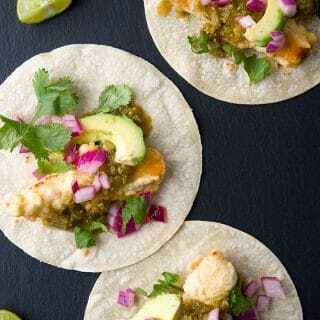 What's in this recipe are what I like with fish tacos, but regular salsa works, as would chopped tomato, and lots of people like to mix chipotles in adobo with mayonnaise and drizzle that on top. Cut the fish into pieces that will fit inside a tortilla. Salt the fish and set aside. Heat the oil in a heavy pot or fryer until it's 350°F. While the oil is heating, mix all the dry ingredients for the batter -- the flour, corn starch, baking soda and salt -- in a large bowl. Have the egg yolk and icy sparkling water handy. Heat the oven to"warm." Set a wire rack on a baking sheet and put that in the oven. When the oil is hot, mix the egg yolk and sparkling water into the batter. Do not beat the heck out of it, you want it lumpy and barely incorporated. Dredge a piece of fish in the batter and slowly dip into the hot oil. Doing this slowly allows the bottom of the fish to set a bit, which reduces the chance the fish will stick to the bottom of the pot. Repeat with as many fish pieces as you can get into the hot oil without crowding. Fry until golden, using a chopstick or fork to flip the pieces over. This should take between 4 and 8 minutes depending on the thickness of your pieces. When they're done, move the fish to the rack in the oven and repeat with the remaining fish. When all the fish is ready, move it to a platter and arrange all the accompaniments to the table. Let everyone make up their own tacos. Looks great. I plan on using it with searobins- one of my favorite underappreciated fish. I head back to Long Island NY each summer (currrently live in the Monterey Bay Area) and love eating these fish and that most other folks look down their noses at. Your photos are positively drool worthy! I need a recipe that leaves out the refined vegetable oils please, as these are very unhealthy. Grilled fish tacos? Thanks Hank! Thank you for the creation. Pinning !